All Using a Regular Deck. And all at a GREAT Price! A card attached to a ribbon with a sticker changes into the selection. 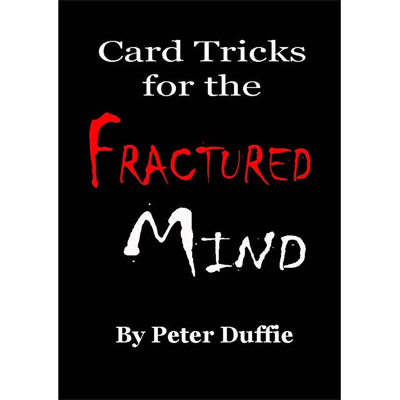 A bluff explanation of Three Card Monte ends in the revelation of a previously signed selected card. Claude Chandler's "Sideways Changing Card" receives the Duffie treatment. A two-card discovery with a little help from the spirit world! Another look at the classic Hofzinser plot where Kings and Queens magically marry! A self-worker based (loosely) around the Card at any Number plot. The effect is "almost" hands off. You cause the four Queens to vanish one by one. Then, in a fast series of actions, you cut the deck into four piles, each with a face up King on top. Finally, you reveal that each King has found his Queen. A different handling for a previous effect that appeared in Covert Concepts. In this version, all four Aces are visible at all times. A trick with an invisible Post-it Note becomes a Miracle with a "visible" Post-it Note! My handling for an Ace effect that appeared in the Lin Searles Folio of Pallbearers Review. In this version, the X cards that are dropped on each Ace can be shown to be random cards. A Four Spot is inserted into the deck, which you immediately crack open at the middle to reveal a display of four single spots ... the four Aces!